Magnolia’s (for the most part) bloom on bare wood making this a stunning plant to see in the spring landscape. They come in various sizes from large multi-trunked shrubs, small to large trees, and some can even be trained as espalier’s against walls and fences. Before they bloom, they’re easily identified by their fuzzy flower buds. The large, highly fragrant flowers come in shades of white, pink, red, purple, and even yellow. They provide a really great pop of color against the usually gray skies this time of year. 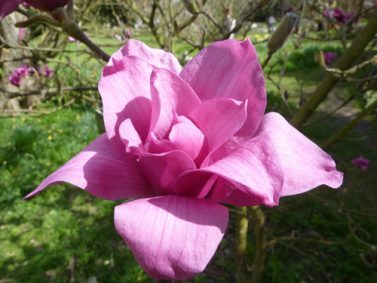 Magnolia’s prefer full sun for best flowering and like to be protected from strong winds. They like well-drained soils with regular watering. They can be pruned in winter but only as needed to remove broken or dead limbs. 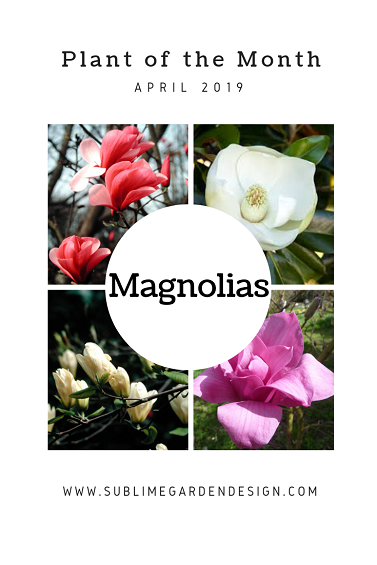 Take a look at this small sampling of Magnolia’s to get you excited for Spring! Vulcan Magnolia (Magnolia x ‘Vulcan’)- Brilliant purple/pink flowers can grow up to 10-12 inches wide and will draw the eye from near and far. Deciduous foliage follows the bright blooms. As a young tree it has a more upright form but as it matures it will become more rounded. It can be used as a large multi-trunked shrub or trained as a medium sized tree. If left in its shrub form it will get to be about 10-15 feet tall and wide but if trained as a tree it can reach 15-25 tall. Galaxy Magnolia (Magnolia x ‘Galaxy’)- Blooming later than some other Magnolia’s, it avoids late spring frosts meaning more fragrant blooms for you. The deep purple-reddish blooms get to be 8-10 inches across and it flowers more profusely as it ages. 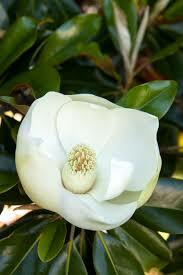 Like the Vulcan Magnolia, it has a narrower form when young, but will widen to about 25 feet and 20 feet tall. Bright green deciduous leaves follow the blooms. 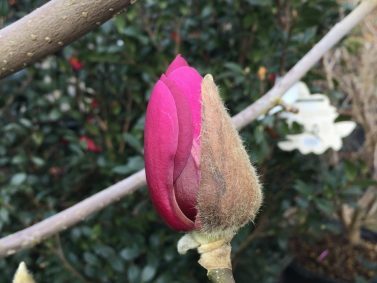 Black Tulip Magnolia (Magnolia x soulangiana ‘Jurmag1’)- One of the most dramatic Magnolias, the Black Tulip Magnolia has deep burgundy-red flowers that are about 6 inches wide. It works well en masse or as a specimen tree. 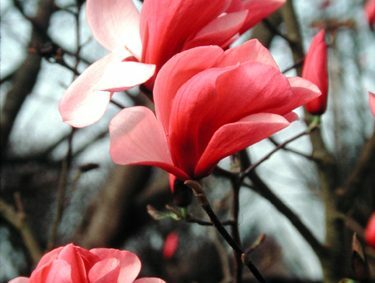 They get to be about 15-20 feet tall and 6-10 feet wide making it better for a small space than some of the other Magnolias. Deciduous foliage is rich green. Elizabeth Magnolia (Magnolia x ‘Elizabeth’)- A profusion of pale-yellow flowers opens in mid-late spring and are quickly followed by dark green leaves, usually while the flowers are still holding on. It has a columnar, pyramidal form which gets to be about 25-40 feet tall and 12-20 feet wide. 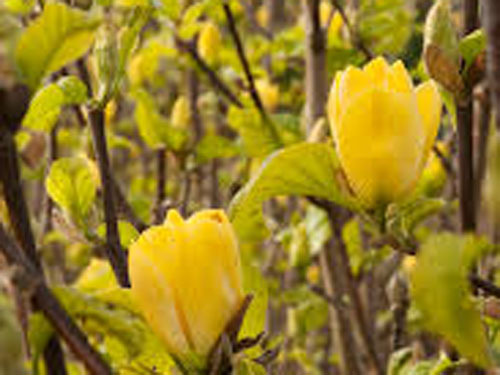 Another yellow option is the Yellow Bird Magnolia (Magnolia acuminata ‘Yellow Bird’) which has bright yellow blooms later in spring right around the same time that the foliage is emerging. It can reach 40 feet tall and 25 feet wide. 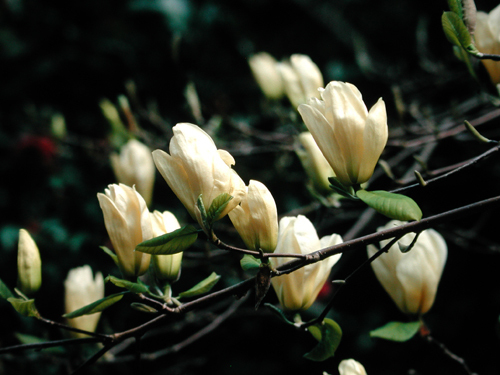 Both Elizabeth and Yellow Bird Magnolias have deciduous foliage. Little Gem Dwarf Southern Magnolia (Magnolia grandiflora ‘Little Gem’)- This columnar Magnolia is a little different than the others. It has evergreen foliage which is dark green with rusty brown undersides. Flowers don’t appear on bare wood, instead waiting for the leaves to come along first. They are white and bloom in late spring through summer. It can reach 20-25 feet tall and 10-15 feet wide. If you haven’t been to the Washington Park Arboretum, especially this time of year, I highly recommend it. 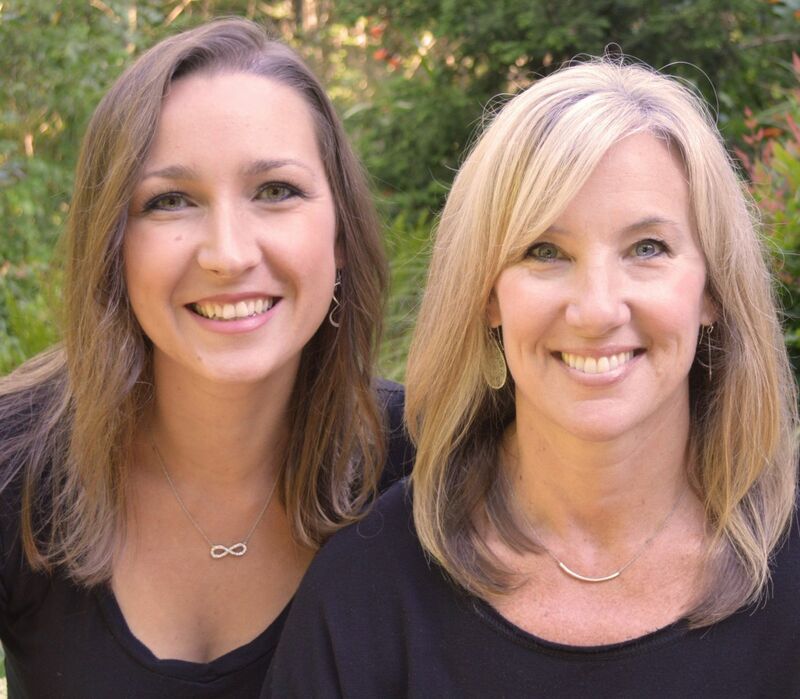 They have a wonderful Magnolia Collection that has been named one of the best in North America. Do you have a favorite Magnolia? Let us know in the comments, we’d love to hear from you! Organized under Buds and Blooms, Plant of the Month, Plants I Dig. Labeled as black tulip magnolia, columnar magnolia, deciduous magnolia, elizabeth magnolia, evergreen magnolia, galaxy magnolia, late spring blooming magnolia, little gem dwarf southern magnolia, magnolia, magnolia acuminata 'yellow bird', magnolia grandiflora 'little gem', magnolia x 'elizabeth, magnolia x 'galaxy', magnolia x 'vulcan', magnolia x soulangiana 'jurmag1', magnolias for large spaces, magnolias for small spaces, plant of the month, spring blooming plants, summer blooming magnolia, vulcan magnolia, washington park arboretum, yellow bird magnolia.